If you would like to find a roommate, you can choose to go through an optional roommate search within your online housing application. Within this process, you will create a profile. From there, you can search for students with similar interests, browse profiles, and send messages to potential roommates. The deadline for a roommate request is May 1, 2019. Once you select your room, you will be able to view your roommate information. We encourage you to contact your new roommate before arriving to campus and communicate about who will be bringing which items or just to get to know each other. Because of many new housing applicants and cancellations that occur over the summer, roommate information can change. We recommend checking your roommate information occasionally before the start of the semester. We find that many students have never had to share a bedroom with anyone else, so it can be an adjustment living with someone else for the first time. 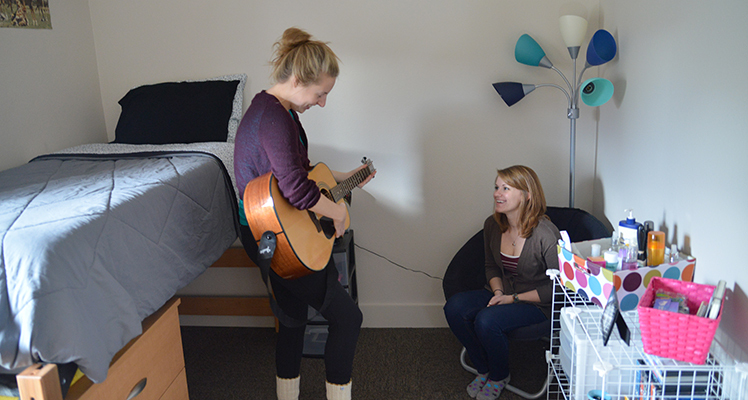 All students have certain needs and expectations about living with a roommate and it is very important to communicate those expectations with your new roommate(s). The key to any positive relationship is open communication about likes and dislikes and coming to an agreement all roommates are comfortable with. It is important to go through this process even if you know the person you will be living with, rather than assuming you don't have anything to communicate about. Your Resident Assistant (RA) will provide each resident with a Roommate Agreement in order to assist students in starting conversations with each other.